This 20 minutes didactic procedure concerns a 64 years old male presenting with anterior wall proven ischemia with diffuse coronary multivessels disease: several calcified mid LAD lesions, first diagonal and left CX lesions, the SYNTAX Score was 14. 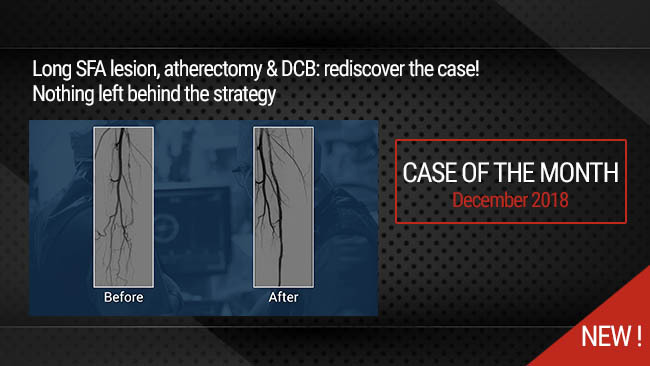 These lesions were treated in the same session by multi-instrumental PCI. Wiring the distal LAD with a workhorse guidewire. Predilatation of distal and proximal LAD lesions with a NC balloon 1.5x15mm. Changing to Rotawire Floppy in the LAD using Finecross microcatheter and trapping technique. Rotational atherectomy using 1.5mm Burr. Exchanging the Rotawire to a workhorse guidewire using Aquaplane technique. Stenting of the distal and proximal LAD lesions using Guiding catheter extension to improve support. Predilatation of the proximal LAD lesion with Scoring balloon and stenting. Stenting of the LCX lesion. Microcatheter using for Rotawire placing in tortuous and calcified lesions. Complex lesions preparation with Rotational atherectomy . Scoring balloon predilatation as complementary technique for optimal preparation after Rotational atherectomy. Usefullness of guiding catheter extension to improve backup support and device delivery. Contrast medium volume control during multivessels PCI. Publication: 2017 Aug 25;13(6):696-705. doi: 10.4244/EIJ-D-17-00473. Authors: Watt J, Austin D, Mackay D, Nolan J, Oldroyd KG. Publication: 2017 Dec;10(12). pii: e005311. doi: 10.1161/CIRCINTERVENTIONS.117.005311. Publication: 2016 Mar;13(3):233-8. doi: 10.11909/j.issn.1671-5411.2016.03.013. Publication: 2016 Apr 8;11(14):e1580-8. doi: 10.4244/EIJV11I14A308.